Having studied in Italy, Francisco de Goya (Fuendetodos, Zaragoza, 1746 – Bordeaux, 1828) moved to Madrid in 1775 and was first employed at the court of Charles III to work on the production of tapestry cartoons on hunting themes for El Escorial. Goya achieved recognition some years later when he was first appointed painter to the King (1786) then First Court Painter (1799). 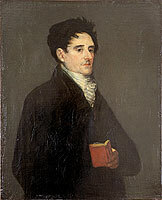 Despite this success at court, Goya maintained his connections with his native Zaragoza and his correspondence with his childhood friend Martín Zapater, offers proof of this ongoing relationship with his circle of friends and relatives while also providing crucial information on the progress of his career. The Prado's exceptional loan of 13 original letters offers the documentary counterpoint to Goya as court painter and this is in fact the essential argument of the exhibition, which moves between Goya's success at the courts of Charles III and Charles IV and the persistent echoes of his origins through his continuing contact with those closest to him. Francisco de Goya. Muchachos trepando a un árbol, 1791-1792 (cartón para tapiz destinado al despacho de Carlos IV en el Real Sitio de San Lorenzo del Escorial. Museo Nacional del Prado. Co-organised by the Museo Nacional del Prado, Fundación Bancaria "la Caixa" and the Bilbao Fine Arts Museum, Goya and the Enlightenment Court will be on display to the public from tomorrow, having been seen at the CaixaForum, Zaragoza. Curated by Manuela B. Mena and Gudrún Maurer, Chief Curator and Curator in the Department of 18th-century Painting and Goya at the Museo del Prado respectively, this exhibition brings together 96 works, many of which (71, of which 52 are oil paintings and the rest documents and examples of the decorative arts) come from the Museo del Prado. and further loans from the Museo de Arte de Ponce, Puerto Rico, the Museo de Zaragoza, the Fundación Colección Ibercaja, the Sociedad Ecónomica Aragonesa de Amigos del País and a number of private collections. In addition to the core group of canvases and cartoons by Goya, the exhibition also features works by other important 18th-century artists such as Luis Paret, Mariano Maella, José del Castillo, Luis Meléndez, Antonio Carnicero and Lorenzo Tiepolo, which together provide a context and also reveal the remarkable originality of Goya's work. Finally, the exhibition includes examples of the above-mentioned correspondence with Martín Zapater, in addition to miniatures, prints and examples of the decorative arts. In addition to extensive restoration carried out for to this exhibition, the research undertaken has revealed new information, reflected, for example, in the presentation of a new portrait and a miniature of Martín Zapater painted by Goya and by Francisca Ifigenia Meléndez respectively, as well as the attribution to Agustín Esteve of a copy of Goya's lost portrait of Ramón Pignatelli. and the presentation in context of Luis Paret's remarkable View of Bermeo, a work recently acquired by the Bilbao Fine Arts Museum. 1. "Zaragoza, my heart, Zaragoza, Zaragoza"
Born in the small village of Fuendetodos, Goya grew up in Zaragoza where he lived with his parents and maintained a modest existence until 1775. In 1773 he married Josefa Bayeu, the sister of Francisco Bayeu, court painter to Charles III, and of Ramón and Friar Manuel Bayeu, who were also painters. Goya left for Madrid on the invitation of his brother-in-law Francisco in order to embark on the career at court to which he had aspired since his youth. Following his training in Zaragoza with José Luzán (1760-64) Goya made an unsuccessful attempt to obtain a grant from the Academia de Bellas Artes de San Fernando in Madrid (1762), nor did he win the Academia's prize for painting in 1766. He left for Rome on a trip which he funded himself (1769-71) to study at the Drawing Academy. Having returned from there, at the age of 23 he obtained various important commissions such as the mural paintings in the choir of the basilica of El Pilar in Zaragoza and the decoration of the church of the Aula Dei Charterhouse. He also produced a significant number of religious paintings for various clients. Artists, architects, sculptors and aristocratic patrons as well as merchant friends and key figures in the economic ventures of the day such as Martín Zapater, Juan Martín de Goicoechea, Ramón Pignatelli and many others kept alive the artist's contacts with Zaragoza, which remained in his memory even in his final years in Bordeaux. Having moved to Madrid with his family in 1775, Goya's first undertaking was to produce 9 tapestry cartoons of hunting scenes for the decoration of the palace at El Escorial. Goya himself enjoyed small game hunting ("the greatest sport in the world"), an enthusiasm which he shared with Martín Zapater, as revealed in the correspondence between the two men who enjoyed access to this activity, previously reserved for the royal family, the nobility and the clergy. This social change, in which the middle classes acquired greater importance, as they did in government at this period, is reflected in official portraits of the period and in paintings on hunting subjects such as Goya's cartoons, which include members of the more modest social classes ennobled through classicising references. In addition, hunting still lifes are now characterised by the realist depiction of the catch, which had had a more symbolic character up to this period. Madrid reached a new peak in 1700 with the ascent to the throne of the Bourbon dynasty from France, which inherited the grandeur and modernity of Louis XIV. By the time Goya arrived at court there had been three Bourbon monarchs: Philip V and his children with María Gabriela de Saboya - Luis I and Ferdinand VI. By 1775 Charles III, son of Isabella Farnese, had assumed the throne. 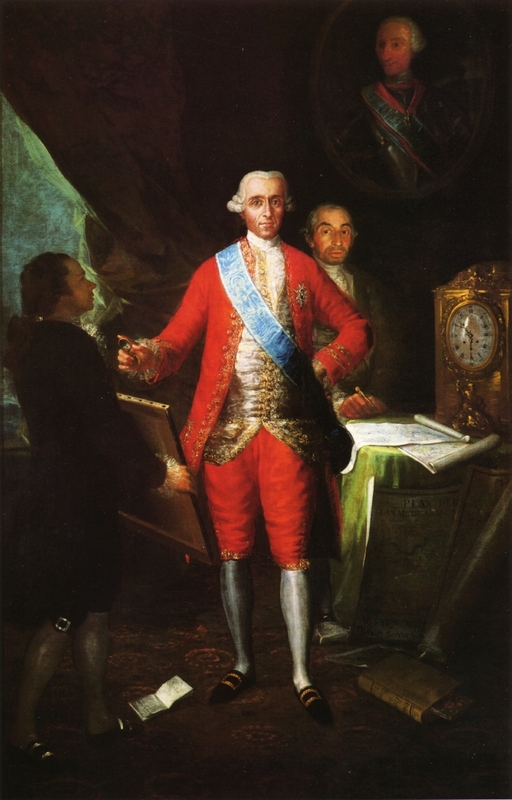 An enlightened monarch who surrounded himself with ministers with advanced ideas – Esquilache, Campomanes and Floridablanca – Charles continued the modernisation of Madrid and of the kingdom in general, developed its industry and trade and restructured the social classes, in which for the first time an emerging bourgeoisie appeared which enjoyed greater access to work. The arts were also encouraged by the crown at this date with the creation of the Fine Arts Academies and the invitation of artists and architects from abroad, including the sophisticated French portraitists Houasse, Ranc and Van Loo; Italian artists who specialised in mythological compositions, such as Giaquinto and Tiepolo; and the architects of the new Royal Palace, Filippo Juvarra, Giovanni Battista Sacchetti and, by the mid-century, Francesco Sabatini, as well as the architectural projects directed by Juan de Villanueva. Exquisite Rococo painters such as Flipart, Amigoni and Paret were succeeded by the Neo-classical Anton Raphael Mengs, who by the 1770s was in turn superseded by the new generation of Spanish painters, including the outstanding figure of Goya. Goya returned to Madrid, never working again in his native city. There were no further royal commissions at this point as they depended on Bayeu but the artist nonetheless prospered with the support of the Secretary of State, the Count of Floridablanca, of various other prominent figures such as the Infante Luis de Borbón and the Duke and Duchess of Osuna, and of intellectuals such as Jovellanos and Ceán Bermúdez. The concept of "refinement", which emerged in Spain in the second half of the 18th century, was related to the idea of civilisation. It implied a desire for intellectual elevation through manners, habits and tastes, and manifested itself in the new social customs and in clothing. New activities became widespread, such as informal debating groups and soirées, celebrations, dances, the theatre and promenades, all of which allowed women to start to take their place in public spaces. In this context clothing played a key role, not only to give them visibility in society but also as a sign of civilised customs. These changes affected all levels of society which, thanks to the increasing democratisation of dress and the commercialisation of increasing accessibly priced textiles, began to resemble each other, which gave rise to a type of game of appearances which the unsuccessful idea of a "national dress" was intended to resolve. The portraits and scenes of everyday life in this section, played out by nobles, majos and dandies, reveal the evolution of fashion from the sophistication and decorative profusion of the Rococo to the simplicity of Neo-classicism with its revolutionary airs. Given that this is the first exhibition in Bilbao devoted to Goya's painting the museum has made a particular effort to present an additional section which reveals the connections between the court and the Basque Country between the late 18th and early 19th century. On display here are 11 portraits of Basque and Navarrans by Goya from this period, constituting a gallery of political, commercial and military figures of the day. and the portrait of Leocadia Zorrilla, Goya's housekeeper in the last years of his life in Bordeaux. and that of Joaquín María Ferrer y Cafranga of 1824, one of the artist's latest portraits, a remarkable psychological introspection emerges in addition to a significant artistic evolution that reveals Goya's authentic genius, individuality and invention.